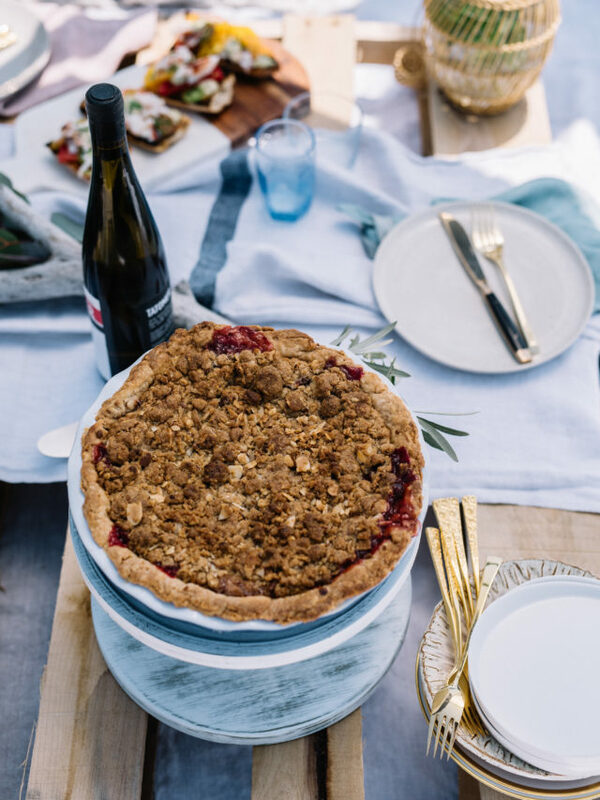 A Summer Beach Picnic + Strawberry Rhubarb Pie with Amaretto Crust! 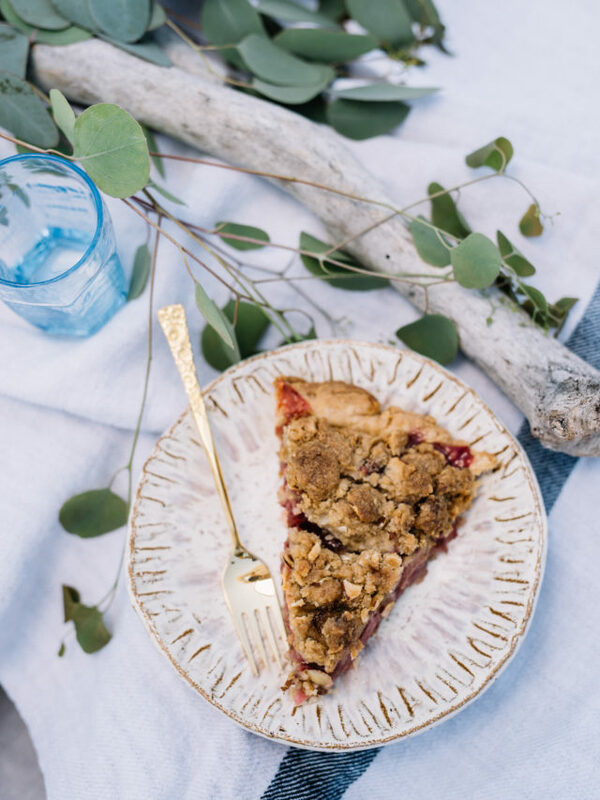 Some of early summer’s star produce comes together beautifully in this perfectly balanced Strawberry Rhubarb Pie with Amaretto Crust. As someone who left a sufficiently cushy job in the corporate world to become self-employed, one of the most frequent questions I’m asked is, “Do you ever miss being in an office with coworkers?” And my answer is always, “Honestly, no.” Sure, the self-employed world can be lonely at times, but I consider myself AMAZINGLY lucky to have found a solid group of like-minded ladies (and yes, even some men) who have also set out on their own and forged a path for themselves in the world of entrepreneurship, specifically in the food, beverage and entertaining bizzes. 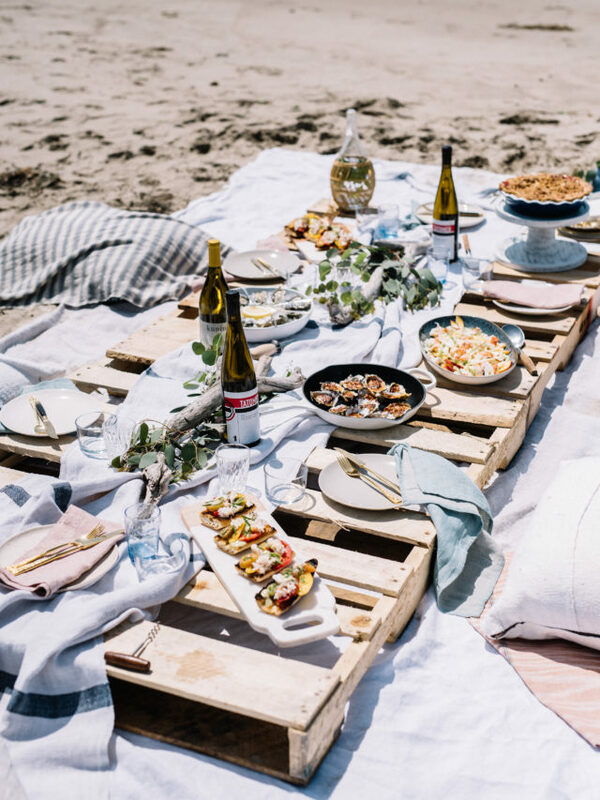 Recently, a few of us got together to kick off summer with a beautifully styled beach picnic featuring some incredibly delicious food and wine. Since I’ve been itching to refine my pie-making skills, I offered to bring one showcasing some of my favorite fruits of the season thus, this Strawberry Rhubarb Pie with Amaretto Crust was born. 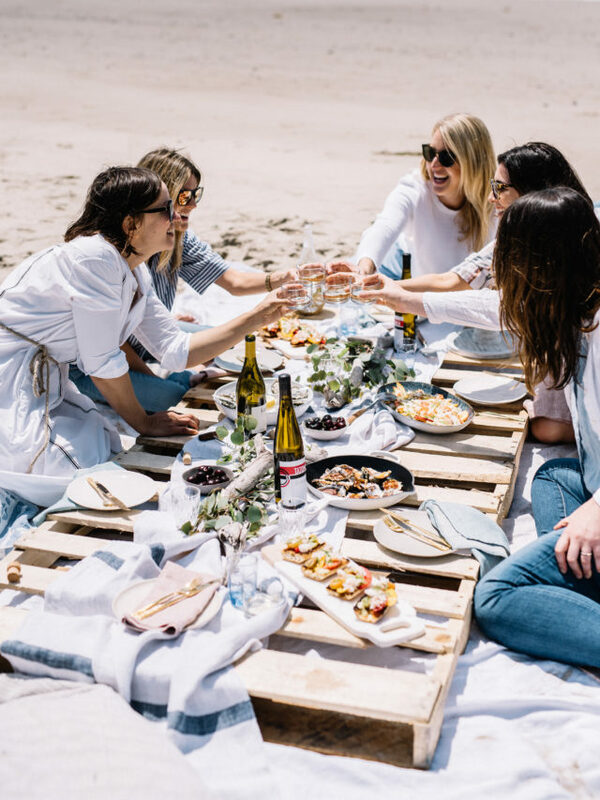 Denisse is a private chef and food photographer based here in Santa Barbara and brought the most refreshing Poached Lobster Salad with Peaches, Shaved Fennel and White Corn and delectable Crab Toasts with Heirloom Tomato & Charred Scallion Aioli. Jamie (also a private chef) just started this “micro-shuckery” here in SB and, let me tell you, you haven’t lived until you’ve tasted these oysters. She brought both raw and BBQ oysters to our little picnic and the BBQ sauce on the cooked ones was just insane! 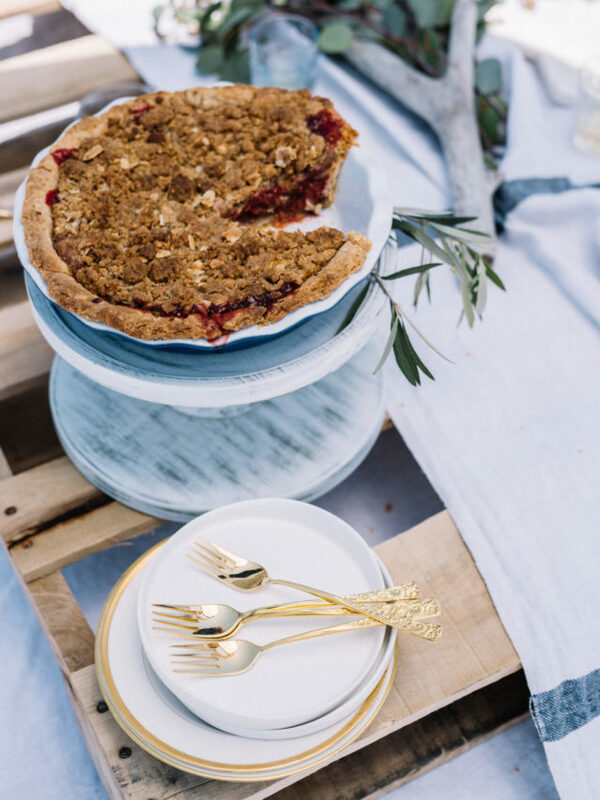 Not only does Viktoriya make some of the most beautiful table linens, she’s also a pro at food and prop styling, She made our entire picnic set-up look like a dream…I only wish I could bring her (and her beautiful napkins and tablecloths) along with me for every picnic I go on! If you plan to serve wine at any get-together you’re hosting, you’ll want to invite Hana-Lee. She chose the perfect wines to pair with each of our dishes. I couldn’t believe what a perfect match the Riverbench Demi-Sec Sparkling Wine was for my Strawberry Rhubarb Pie! Even though she stepped in for another photographer at the last minute, Meg was an absolute dream to work with and captured all of the beautiful images you see here and on the others’ posts. Okay, now back to this pie. First, raise your hand if you (like me) are totally intimidated by pie-making because of the difficulty of making pie dough, rolling it out and then not only getting it to fit just right in your pie plate but also baking it to a beautiful golden brown in perfect synchronization to whatever filling you put inside. Next, the good news – it gets easier! Practice makes perfect. Once you find a recipe you like and practice it a time or two, you start to get a better feel for how it should look, feel, etc. I’m happy to say that, now that I have a basic pie crust recipe that I feel totally confident in, I’ll be making so many more pies and, after trying this recipe, I hope you will, too! It’s a fairly popular notion that adding chilled vodka to your pie dough (instead of water) will make it extra tender and flaky due to the alcohol dissolving during the cooking process. 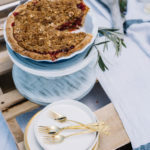 You know I’m all about using booze when needed, but for this recipe you’ll find me subbing in amaretto for the vodka, adding that slight nuttiness that goes perfectly with the rest of the components of the pie. For all other aspects of the dough, I turned to my favorite Model Bakery (affiliate link) recipe as a guide – I knew they wouldn’t let me down! Although the ingredients for the filling are all pretty typical, there is one ingredient that may look a little odd – balsamic vinegar. I added this to bring depth and a slight tang to the filling that pair perfectly with all the almond notes tied in throughout. I have to say, for being such a novice in this particular aspect of baking, this Strawberry Rhubarb Pie with Amaretto Crust was a pretty huge hit. It’s also perfectly portable which makes it a great dish to contribute to any 4th of July celebrations you may be attending this week. 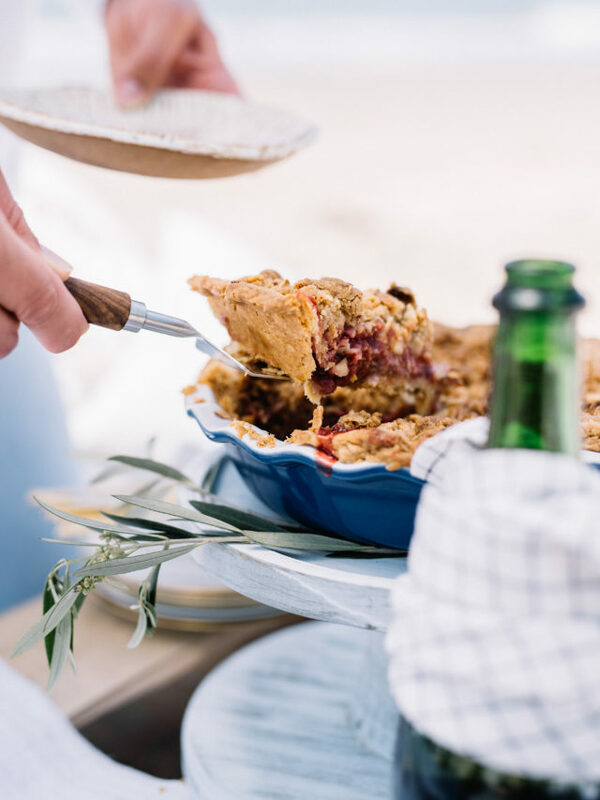 Some of early summer’s star produce comes together beautifully in this perfectly balanced dessert that's perfect for any warm weather get-together. Begin making the dough at least an hour or two before you plan on baking your pie. In a large bowl, whisk together the flour, sugar and salt. Next, using a pastry blender, cut in both the butter and shortening until dough is blended but crumbly with some pea-sized pieces. Slowly mix in the amaretto using a fork until a loose dough begins to form. Using your hands, shape the dough into a thick disk. Cover in plastic wrap and refrigerate for at least an hour, or even overnight. To make the filling, combine strawberries, rhubarb, balsamic vinegar, sugar and flour in a large bowl. Mix until the fruit is evenly coated with the sugar, flour and vinegar. Refrigerate until you’re ready to bake your pie. Finally, assemble the streusel topping. Mix together all streusel ingredients in a medium bowl, using your fingers as needed to break up the butter pieces and make the mixture even and crumbly. Pull out your refrigerated pie dough about 15 minutes before you’re ready to start baking. This will allow it to come back down to room temperature a bit and make it easier to roll out. Once your dough is at a “roll-able” temperature, roll it into an approximately 13-inch circle and fit it into a 9-inch pie pan. You may need to trim some edges and work the dough a bit once it’s in the pan to get the crust as uniform as possible. Crimp the ends as desired and then freeze for 15-30 minutes. Preheat the oven to 400 degrees Fahrenheit. Remove your crust from the freezer and pour in the filling, then top with the streusel.